Borussia Dortmund narrowed the gap on Bundesliga leaders Bayern Munich with a hard-fought win against bottom side Hannover. 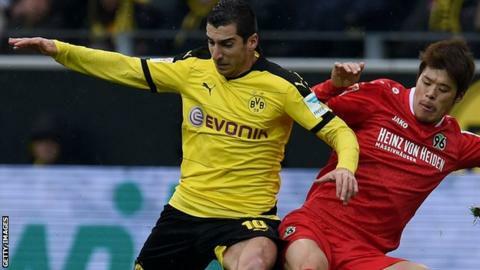 Henrikh Mkhitaryan's sublime solo goal proved the difference as second-placed Dortmund moved within five points. The Armenia captain ran at the away defence from deep before firing into the bottom corner from 20 yards. Pep Guardiola's side can restore their eight-point lead with a win at relegation battlers Augsburg on Sunday. Bayer Leverkusen moved into third when they fought back from behind to win 2-1 at Darmstadt, while Hertha Berlin dropped to fourth after losing 2-0 at Stuttgart. Second-bottom Hoffenheim, with new 28-year-old manager Julian Nagelsmann taking charge for the first time, drew 1-1 at relegation rivals Werder Bremen. Match ends, Borussia Dortmund 1, Hannover 96 0. Second Half ends, Borussia Dortmund 1, Hannover 96 0. Offside, Borussia Dortmund. Shinji Kagawa tries a through ball, but Marco Reus is caught offside. Corner, Borussia Dortmund. Conceded by Salif Sané. Corner, Borussia Dortmund. Conceded by Miiko Albornoz. Artur Sobiech (Hannover 96) wins a free kick in the attacking half. Offside, Hannover 96. Salif Sané tries a through ball, but Allan Saint-Maximin is caught offside. Ceyhun Gülselam (Hannover 96) wins a free kick in the defensive half. Kenan Karaman (Hannover 96) wins a free kick in the attacking half. Offside, Borussia Dortmund. Mats Hummels tries a through ball, but Marco Reus is caught offside. Allan Saint-Maximin (Hannover 96) wins a free kick in the defensive half. Corner, Borussia Dortmund. Conceded by Ceyhun Gülselam. Attempt blocked. Julian Weigl (Borussia Dortmund) right footed shot from the left side of the box is blocked. Assisted by Lukasz Piszczek. Attempt missed. Lukasz Piszczek (Borussia Dortmund) header from the centre of the box misses to the left. Assisted by Marco Reus with a cross following a corner. Substitution, Borussia Dortmund. Erik Durm replaces Henrikh Mkhitaryan. Substitution, Borussia Dortmund. Julian Weigl replaces Matthias Ginter. Attempt saved. Marco Reus (Borussia Dortmund) right footed shot from a difficult angle on the right is saved in the bottom right corner. Assisted by Henrikh Mkhitaryan with a through ball. Substitution, Hannover 96. Allan Saint-Maximin replaces Edgar Prib. Matthias Ginter (Borussia Dortmund) wins a free kick in the defensive half. Foul by Edgar Prib (Hannover 96). Shinji Kagawa (Borussia Dortmund) is shown the yellow card for a bad foul. Salif Sané (Hannover 96) wins a free kick in the defensive half. Andre Hoffmann (Hannover 96) wins a free kick in the attacking half. Substitution, Borussia Dortmund. Christian Pulisic replaces Gonzalo Castro.